Long ago, according to, Morivoshi, of the dark priesthood. Oun’Mordrith shaped and created the world according to his will. Over time, the people of the land became forgetful of Oun’mordrith’s great work and sacrifice… the creation of Sosaria itself. In his rage, the Dark God began to destroy Sosaria releasing the forces of chaos, despair and suffering upon mankind. To mark the sacred place where Oun’Mordrith first emerged from chaos and began to weave Sosaria a shrine was built at 143’10’S/21’10’E. Here the idol of Oun’Mordrith basks in a radiant pool of blood and gore. The loyal dark priests make grisly offerings to their God and contemplate his mysteries. At a second temple located at 66’S 0’S/ 31′ 59’E, the priests house relics of Oun’Mordrith and venerate his teachings. These dark priests seem to be deeply affected by their deity and have been driven mad by his influence. 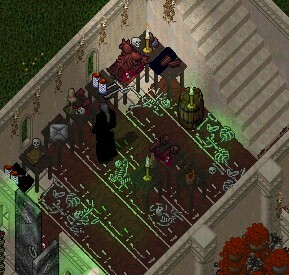 Kan Ku, a necromantic priest of the order said “the temple is still under construction”. To find out more about the Priesthood of Oun’Mordrith, contact: Kan Ku through ICQ at 40776323.